Zombie Outbreak Simulator for iOS Now Available! If you buy it, it’d be great if you could post a review on the app store (good or bad! ), thanks! We hope you enjoy this mobile version of Zombie Outbreak Simulator, we look forward to seeing how it is received! We are happy to announce that the open beta version of Class 3 Outbreak’s Editor is out now! Saxon has been working hard on this over the last year, and in the mean time C3O is closing in on 1 million plays. With the new editor, you can now paint down maps in your local area, then unleash the zombie hordes upon your street, workplace or school. 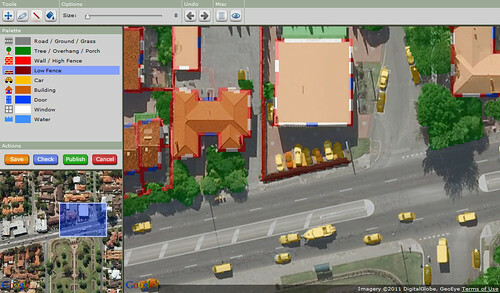 Map creation is achieved by painting down colors over the top of the satellite imagery – red for walls, green for trees and grey for flat ground. There are a few basic tools such as a line tool, free hand tool and fill, with the ability to change brush size as well. Once you’ve finished, you can publish your map and share it with friends or fellow gamers. 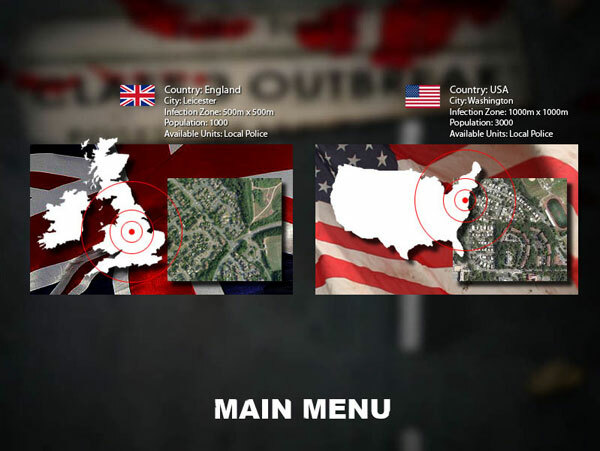 The game has also been moved to www.class3outbreak.com, where you’ll see that we have a world map showing the location of outbreaks across the globe. Maps that are published are moderated by myself, and if they’re of high enough quality, they go on the home page as one of the red markers. Even if you don’t get featured, you can still play and share your map. So now that our most important feature is out the door, we will be moving back to gameplay, so that players can load up their neighborhood map, then begin the task of surviving the outbreak. 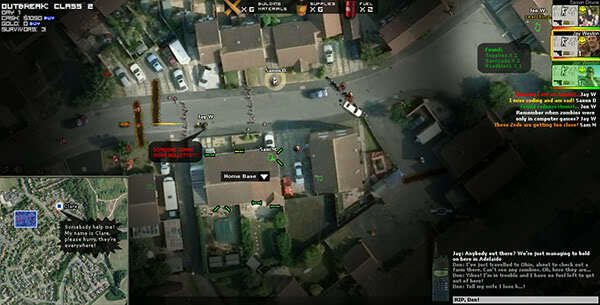 Unlike any other game, you will walk the streets and be familiar with your own surroundings. Very first on the agenda is controllable units, I believe we will be starting with just one controllable civilian, then we will go from there. We look forward to seeing what maps you come up with. So far I’ve been deluged with about 60-70 map moderation requests in 2 days, which is a good sign. Tell us what you think, constructive good or bad criticisms are welcome. If you’d like to follow development as we get back into the fun stuff, you can follow me on Twitter @JayWeston or Saxon @SaxonDruce. Then there’s our Facebook page at www.facebook.com/Class3Outbreak and the forums. Let’s Make Games is a volunteer group which organises events to help foster the local game development community in Perth, Western Australia (where I live). A couple of months ago, Nick Lowe from Let’s Make Games asked me to present a talk on Flash game publishing, at an event they were organising with talks from a few local game developers. There are many ways to publish Flash games, and I’m no expert in any of them. So I decided to present a ‘history of Class 3 Outbreak’, including details of how we published C3O, and some other miscellaneous info about Flash game development. Thanks to Richard and Ben from Let’s Make Games for preparing the videos. If you prefer reading to watching, you can also see the original slides for my talk, along with the original notes. For those of you who don’t want to watch a video or read slides, below are some of the highlights of the talk. Jay and I started development on C3O in March 2009. In November 2009 we released Zombie Outbreak Simulator (which has been played over 800,000 times since), and in April 2010 we released Class 3 Outbreak (which has been played over 650,000 times since). 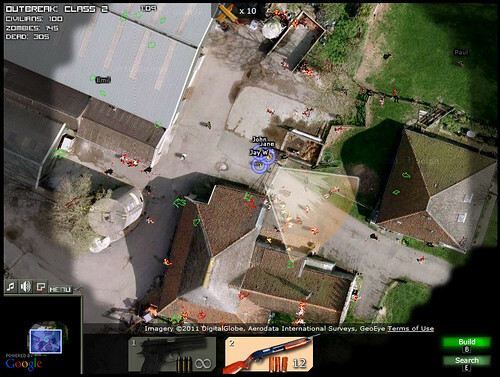 We first released the Zombie Outbreak Simulator (ZOS) on our own website. We weren’t sure how it would go, but a few days after it was released it appeared on the front page of Digg. For the next two days it received 90,000 hits per day (about once per second). 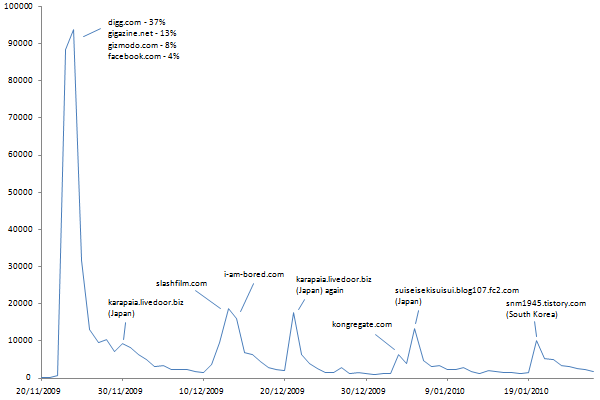 We thought that a Flash portal might want to put ZOS on their own site, to get that traffic for themselves. So we asked some portals if they would be interested in sponsoring ZOS. What we learnt was that most Flash games receive an initial spike of plays, and then die off very quickly. Therefore sponsors are only interested in games before they’ve been publicly released. It was therefore too late for us to try to get sponsorship for ZOS. Our traffic confirmed this – within a week it was down to 10,000 plays per day, and then soon settled at around 1000 plays per day. We originally thought that sponsors wanted to sponsor games so that people would go to the sponsor’s site to play them. It turns out that sponsors actually want the game to spread virally to hundreds and thousands of other portals. A sponsored game will include links back to the sponsor’s site, which will drive traffic back to the sponsor. 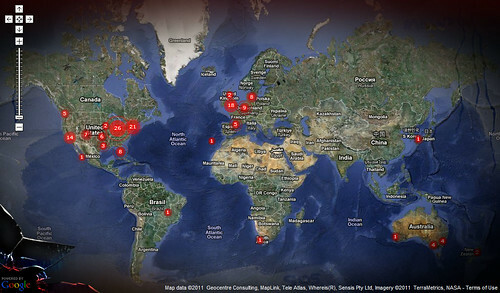 Our game is built on Google maps, which uses a key that locks the game to a single website. This meant that it was impossible for ZOS to spread to other portals, and therefore no sponsor would want it. We initially planned to release ZOS as a preview for C3O, to help build interest. We could have released ZOS earlier, but we waited until we had almost finished C3O, with the plan being to release C3O one week after ZOS. In hindsight that was a crazy idea. We got caught up in the excitement surrounding ZOS, which consumed all of the free time we had planned to use to finish and release C3O. Then we went into the Christmas period, where spending time with family left little time spare for development of C3O. In the end it took us about 4 months to release C3O after ZOS. Part of the reason was that we modified C3O so that we’d be able to sell it to sponsors. We bought the imagery for a region of Leicester in the UK and embedded it into the game. This made it possible for the game to spread to portals, because the Leicester map could be played anywhere. The original Google-based Washington map would still be locked to a single site – so we planned to link it back to the sponsor’s site. When C3O was ready to release we started to see if any sponsors would be interested in it. We didn’t get as good a response as we were hoping for. The average Flash gamer has a very short attention span. They need to be hooked within the first minute or two of play, or else they will just go and play any of the other hundreds of games which are constantly released. C3O takes around 15 to 30 minutes to play, and starts slowly. Also we had cut so many features from our original plans in order to finally release something, that the game had little replay value. The end result was a game which wasn’t very attractive to sponsors. This chart shows how long people were playing our game for, during the first few weeks after release. A large proportion didn’t make it to the 15 minutes required to play a full game. Our best sponsorship offer was for $4500, but in the end we decided not to accept it, and instead we released C3O ourselves on our own site. We thought we might be able to do better than that with our own ads. When we developed C3O we decided to make it 800×600 pixels in size. It turns out that many portals can only handle games up to a maximum of 650 or 700 pixels wide. Therefore some sponsors won’t accept games wider than that, since it reduces the number of portals the game can spread to. Our first and third top sponsor offers couldn’t accept an 800 pixel wide game, and asked if we could make it narrower. We tried reducing the size but didn’t like how it looked. So this was another reason why we decided to release the game ourselves. So in the end we self-published both ZOS and C3O, earning revenue solely from the many ads we placed in and around the games. Below is the chart from the most interesting slide in the talk – how much money we’ve made. This shows our cumulative revenue, expenses and profit. We’ve made about $3000, spent about $2000 and so have a profit of about $1000. 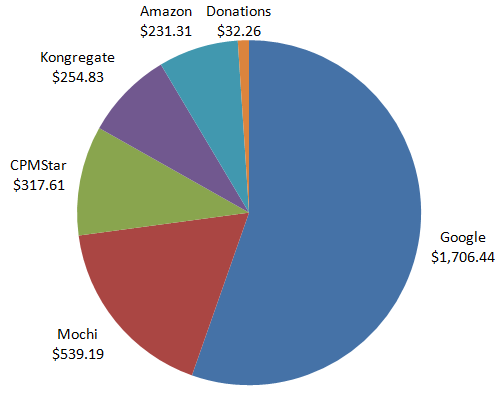 This chart is the breakdown of where we made our revenue. Our biggest earner is our Google ads, even though only around two thirds of our plays have been on our own website where the Google ads are displayed. 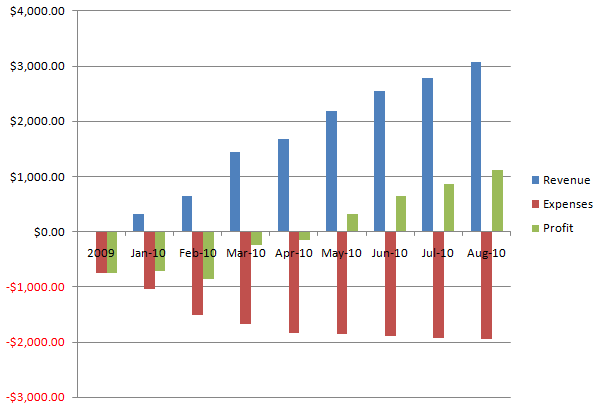 Note these charts are in Australian Dollars, which are currently worth about the same as US dollars. It’s been a while since we’ve posted any game updates to our blog. What we’re working on at the moment is a new version of Class 3 Outbreak with an editor. 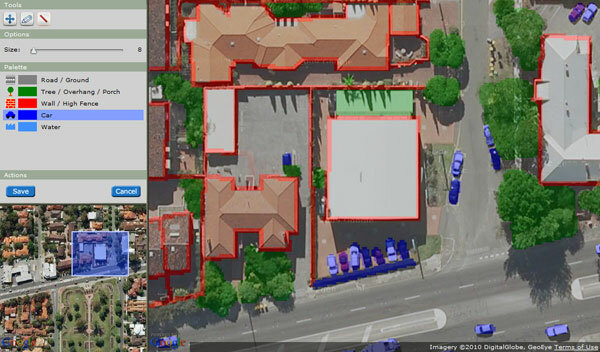 This will make it possible for anyone to choose anywhere in the world (where the Google maps image quality is good enough), draw in the locations of the walls, trees etc, and then send in the zombie apocalypse. When we’re ready to go into full beta testing we’ll post an update here calling for beta testers. In the meantime I’ve been posting some preview screenshots to our forums: 15th October, 2nd October, 20th September, 5th September, 16th August, 3rd July. For more updates on how we are progressing with the editor you can keep an eye on our forums, or follow me on Twitter.